Heart-throbs come in all shapes and sizes these days – just take a look at the ‘Milifandom’ of before our last general election. Now, we’re not saying that this individual is as unlikely an icon as Ed Miliband, but the levels of devotion are approaching properly scary territory. 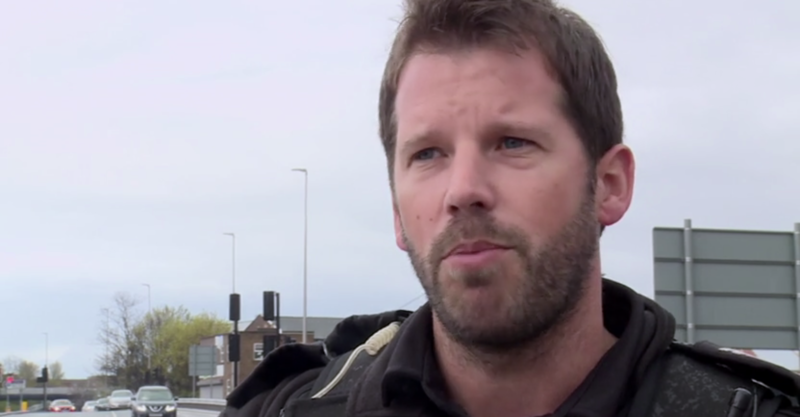 Sergeant Kevin Salter is one of Cleveland and Durham’s Road Policing Unit, better known as Channel Five’s Police Interceptors. These trained response and pursuit drivers patrol Middlesbrough, Darlington, Durham and Redcar, plucking miscreants and ne’er-do-wells from the public roads in the documentary series. Since first appearing on Police Interceptors in September 2015, our Kev has attracted quite the fanbase, as evidenced by the following selection of tweets about the Teesside traffic cop. He’s driving ’em wild! True, he has some competition – with Paul ‘Jacko’ Jackson another favourite – but it looks like he’s well in the lead. Charlotte Cooper’s eager anticipation is a little unsettling, but ultimately just a spot of fandom. Meanwhile, Paige Gallone is letting a bit of the truth about Kev’s appeal out. And Laura Spillers leaps right in with a declaration of love. Emma Morgan seems to have a pretty severe bout of Salteritis. Kev’s attraction seems to know no gender limits, either. Even some of his colleagues seem to have a man-crush on him. He’s now bowed to social media pressure and signed up to Twitter at @sgtkevsalter.